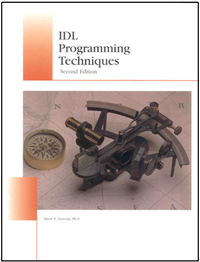 These are programs from the Coyote Library that are specifically designed to work with color in IDL graphics routines. 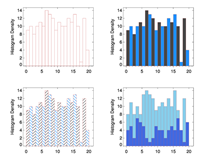 Over 50 examples of graphics output (with IDL code) using these color tools can be seen in the Coyote Plot Gallery. 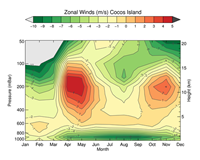 CINDEX Allows you to see the color index number associated with each color. 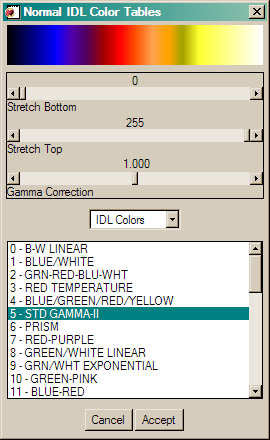 cgCOLOR A program for selecting device-independent colors by names. cgGETCOLORSTATE This function determines if the graphics device is set to use decomposed or indexed color. cgSETCOLORSTATE This command sets the current color state in a device and version independent way. 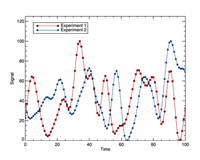 COLORSAREIDENTICAL Determines if two colors, specified in different ways, are identical. 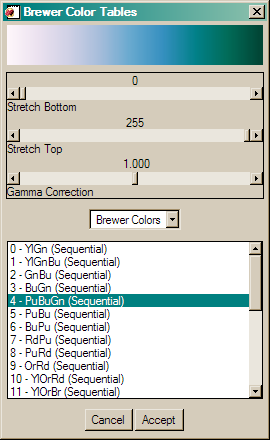 FSC_COLORSELECT A compound widget for selecting a color name or color table. PICKCOLOR Utility for picking or specifying a drawing color. SETDECOMPOSEDSTATE Sets a device/version independent current decomposition state. 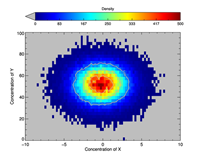 XCOLORS Changes color tables interactively. Absolutely required for 24-bit displays. A utility routine that allows you to see the color index number assoicated with each color in the current color table. 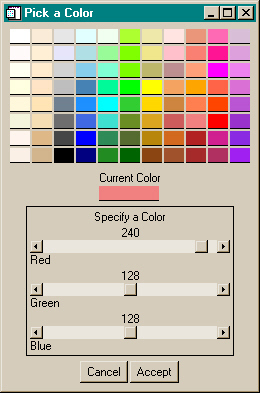 On 24-bit displays, you may need to click the cursor in the color table window to force the colors to update themselves to the current color table. To load colors from this program, you need the XColors program. And for best results, download the cgImage program, as well. A utility routine for determining if two colors refer to the same RGB value. The color may be specified as a color index value, a long integer value, or a color name recognized by cgColor. 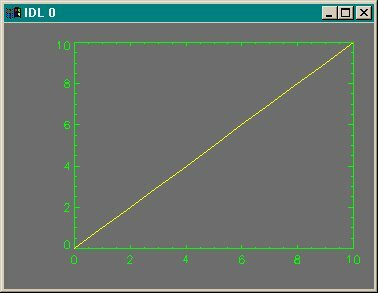 This program can also read an ASCII file of color names and values, so you don't have to use the 88 colors provided. Updated 15 May 2008 to use Brewer Colors in addition to the normal colors. 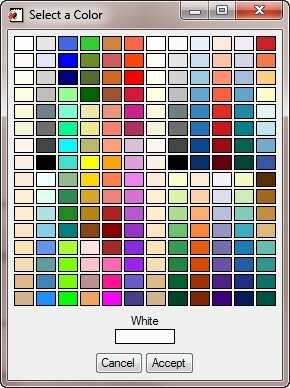 This program shows you one way to create a colorbar for your programs. This colorbar appears exactly the same in a PostScript file as it does on your display. A blocking or modal dialog widget for selecting a specific color name. Eighty-eight colors are available. The return value of this function is the new color name. Keywords allow the loading of this color directly in the color table. This program requires the cgColor program. Updated 15 May 2008 to use Brewer Colors. 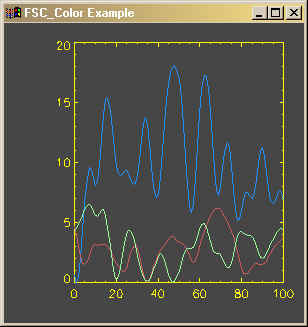 This function provides a device-independent way to determine if a graphics device is currently set to use decomposed color (sometimes known as true-color) or to use indexed color. The program was mandated by the introduction of PostScript 24-bit decomposed color in IDL 7.1 without any way to determine programmatically if the PostScript device was currently in 24-bit color mode. The program works identically with WIN, X, MAC, Z, and PS devices, as well as others. This program shows you how to create a colorbar for your programs, but written as an object. Direct graphics programs written as objects have a number of advantages. This colorbar, for example, has an Erase method that can be used to erase the colorbar from the display. Plus, colorbar properties can be changed and displayed immediately. The colorbar appears exactly the same in a PostScript file as it does on your display. A modal dialog widget for selecting a specific color. One of 88 pre-defined color selections can be made, or the user can manipulate slider widgets to create any RGB color triple. The return value of this function is the new color triple. The color table on entry is the same as the color table on exit. You must specifically load the new color for it to take effect. This program requires the cgColor program. Updated 15 May 2008 to use Brewer Colors, too. There are now 200 different colors available. A widget program for changing color tables, it is similar to XLOADCT. This program has been extensively modified. In particular, it now works on 24-bit color displays exactly the way it works on 8-bit displays. NotifyID, NotifyObj, and NotifyPro keywords allow you to identify other widgets, objects, or programs that should be notified when the user changes the color tables. Such notification is essential for updating colors on 24-bit displays. (See the Color_Example program code for an example of how this works.) This program is essential for writing "color aware" widget programs. No common blocks are used, so each graphics window on your display can have its own color table loading tool if you like. A Cancel button restores the original color table if you change your mind about the colors you load. This program is essential if you are loading color tables from widget programs. Updated on 14 May 2008 to support Brewer Colors. You will need to download the fsc_brewer.tbl file from Coyote Library to use this functionality. Install it either in the $IDL_DIR/resource/colors directory or in any directory in the IDL path.